In true Manchester style, it rained the whole day. So much so, I had to put a jumper over my outfit to keep me warm. Umbrella in one hand and handbag in the other, it was time to eat at a restaurant I've heard so many people rave about, one that ranks extremely high on Trip-advisor (always something that sways me to visit a restaurant) and one that I've wanted to visit for quite some time now. Australasia is in Spinningfields in Manchester, you can't miss the big glass entrance to it, but the restaurant itself is hidden down a staircase inside the glass entrance in the middle of the street. and were shocked and excited to see a busy, vibrant, modern looking restaurant. The atmosphere was immediately fabulous. You don't realise that you're underground at all, if anything, it's really quite comforting, the restaurant is welcoming, warm and beautifully designed, so much so that I could happily stay there forever. 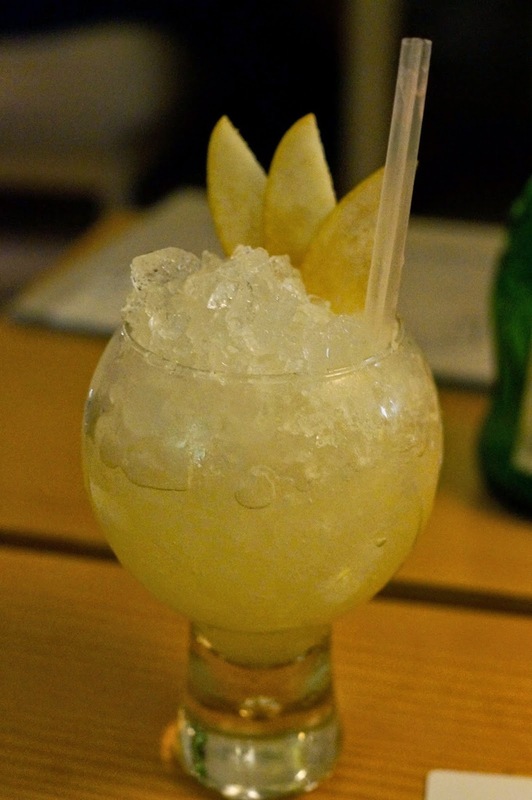 I went for the Asian Pear Crush, brimming full of honjozo sake, elderflower liqueur (my favourite), apple juice, lemon juice and Asian pear. Australasia is owned by Living Ventures, the same people who brought you the Alchemist (review here) and the Botanist (review here) - both are unbelievably good bars/restaurants so I was more than excited to try Australasia. Back to the drinks. 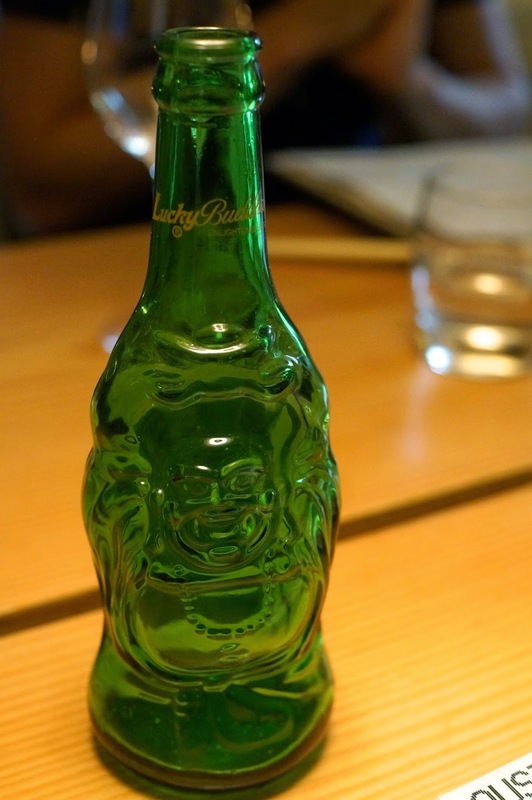 Jack played it safe with a lucky beer, we stroked the Buddha's belly for good luck. We took in the atmosphere whilst the rest of our guests arrived... I'd say it's quite shabby chic, ridiculously modern and clean with nice wooden features which give it a beautiful rustic feel. everything about the decor is perfect, it's my kind of interior. go “local” and select several smaller dishes from pages 2 and 3.
to the centre of the table throughout your meal. Both options appealed to me and I had a tough choice deciding! The wine menu came on an ipad - cool or what?! We decided to try one of the new sharing drinks with our meal and wow, I was blown away. You may have seen me Instagram this photograph, because I was so blown away I had to tell the whole world about it. I want to buy loads of these for my house and just fill them with drinks all the time. Probably the coolest cocktail I've ever had, it tasted amazing too. Inside: lychee & passion punch, green mark vodka, lychee liqueur, passoã, lychee purée, lemon juice, passion fruit, lemonade. This is a Summer must-have. Easily the best cocktail I've ever had. The food started arriving, me and Jack shared the squid and fresh lime tempura. Easily the best tempura I've had. Prawns and asparagus tempura came next (can you tell we like tempura?). Obviously, this was also amazing. Next we went for the grilled mackerel in banana leaves. To say I don't eat fishy fish, it was actually really delicious. I may have been converted. My friends went for the hand dived scallops with belly pork, chilli caramel and cucumber pickle. and the chicken, lime and coconut salad. We were quiet as we ate, the only words spoken were 'yum' 'omg' and constant chomping. The mains arrived and didn't disappoint, Adam went for crispy suckling pork belly with a pineapple curry... apparently it was rich, tender and the sauce was amazing. He had some sticky rice and said it was perfect. Meg went for the roasted monkfish with razor clams, chorizo and squid. She said it was perfectly mild, and one of the best monkfishes she's had, in both taste and presentation. It was creatively presented and we all really loved this. It was even decorated with squid ink. We were told that the chips were really good, so obviously ordered these too. More tapas for me and Jack arrived. so succulent and delicious, I dropped one of mine on the floor though so sadly couldn't enjoy the taste for long but they were perfectly sticky and yummy. I wanted more. Yum Yum rice squares also came to the table, just because I liked the name. They came with a delicious avocado dip which tasted divine. I'm sorry about my paleness, I'm actually in Greece whilst posting this (to do some blogging yay!) so I'm starting fresh with my tan and hoping to get tanned whilst out there. Playsuit: C/O H&M, similar here and here. I tried some sake because I didn't want to mix my drinks, the waiter was amazing and he recommended that I try it. It tasted like a really sweet wine, I was pleasantly surprised with how delicious it was. at this point the restaurant was really getting full, with only one or two spare tables. They have some booths at the far end of the restaurant and they're seriously the coolest tables, I want to book them out for my 21st birthday! For dessert I had the most dreamy amazing take on carrot cake, carrot sponge with amazing biscuit underneath...cream cheese ice cream too, pretty epic! Jack went for the garden buttermilk panna cotta, it was like a gorgeous fruity garden with edible soil. Meg went for artisan ice-creams and sorbets. Like the rest of the meal, the desserts all tasted incredible - (we all had a little bit of each) and the presentation was amazing too. The restaurant got busier too and then it was time for us to leave, it was Katy Perry time! I am so impressed with Australasia, they really didn't let me down. The food was perfect, the presentation was amazing and the atmosphere was addictive. Usually, a restaurant has one of the three, but Australasia had all three. ...we spent our Monday eating amazing ice-creams! All in all, I had an absolutely lovely weekend. I am so happy, thank you so much Boohoo and thank you to my fabulous boyfriend for spending the weekend with me! What have you been up to this weekend? Do you like Katy Perry? Have you eaten at Australasia? Do you like the sound of it? Do you love the look of my massive ice creams aha? I LOVE Katy Perry. I saw her a couple of years ago and thought she was awesome. That restaurant looks amazing too. Looks incredible! And that ice cream - YUM! Also very jealous. The food looks great. Im a sucker for ice cream have a great time an keep blogging i love the amazing pics you add to all your blogs . Amazing photos and seems like a great meal! I wish I could eat all those dishes as a read this post haha.